My full notes and analysis from the past week: September 17-23, 2017. Periodicals covered in this Wall Street Recap include the WSJ, FT, NYT, and LA Times. In the depths of the ocean, the glow from a small lure stands out among the darkness. Fish from the surrounding waters swim toward the lure, tempted with the promise of a free lunch. Little do they realize that they are swimming right into the jaws of an angler fish and their impending doom. Stellar growth wrapped around massive consumer demand. Even though those industries had favorable long-term tail-winds, industry returns were abysmal and left thousands of bankrupt companies in its wake. Why? Durable Moats are Illusive: “Hot” industries are defined by growth and rapid change. 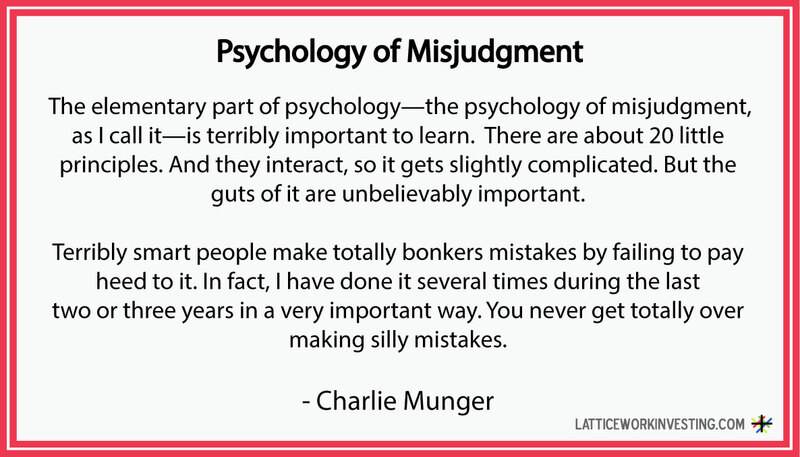 This constantly evolving environment makes it incredibly hard to predict winners and losers. The best product or service today may become obsolete tomorrow. And a perceived competitive advantage today may vanish overnight. Wild Enthusiasm Attracts Too Much Capital: Wild enthusiasm attracts massive amounts of capital into hot industries. This in turn increases competitive pressures and drives down the returns on invested capital. Hot industries are like a fluid with low viscosity. They are fluid, in a state of change, and have little resistance to deformation by (industry) stress. All of which make them hard to predict. Meanwhile, industries and businesses that are highly viscous are “sticky”. Their future can be predicted with reasonable confidence. As a fluid increases in temperature, its viscosity decreases (i.e. becomes less sticky). Applying that model to investing, as an industry becomes “hot”, it becomes more fluid and less predictable. 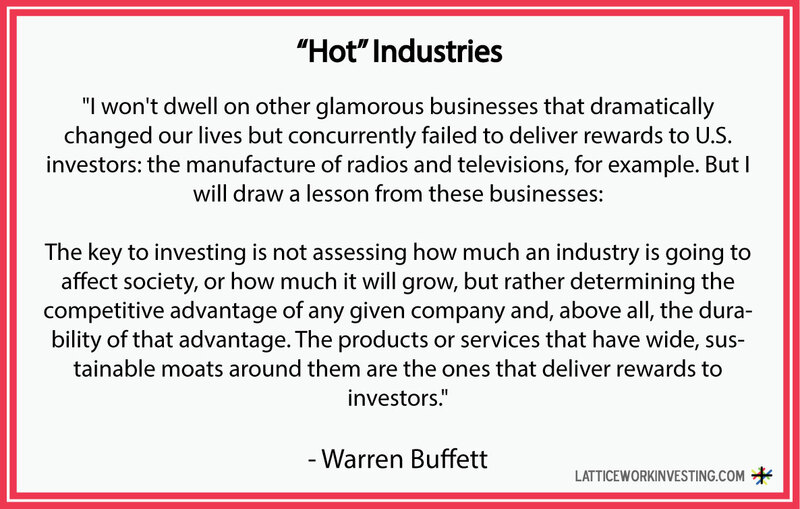 Avoid “Hot” Industries: Subject to intense competition and an ever shifting environment, it is challenging if not impossible to predict winners and losers in a hot industry. Invest in Sticky “Predictable” Businesses: Investing in sticky businesses follows Buffett’s prescription of not fooling yourself and not losing money. Netflix, Tesla, and Blue Apron are the hottest companies in hottest industries. Each one is contending with wild enthusiasm and a flood of investment capital. Some of the most recent developments threatening these companies are listed below. Bob Miller, chief executive of Boise, Idaho-based Albertsons, said in an interview Wednesday: “We think there’s an opportunity to grow this thing tremendously,” adding that the supermarket will give Plated a “cost advantage” over other meal-kit companies by the scale of its food purchasing and network of 18 manufacturing plants. What started out as a plan to reduce the pigeon population in Lisbon, has turned into a mission to provide “dignity and quality of life” to pigeons. “All the profits go to Belarus, all the risks are on the Lithuanian side” – Regarding Nuclear power plant being constructed in Belarus, near the Lithuanian boarder. Part 1 of my full notes and analysis from the past two week: September 3-16, 2017. Periodicals covered in this Wall Street Recap include the WSJ, FT, NYT, and LA Times. Ideally a company’s product or service would increase in demand as its customers become less ignorant. This is not always the case. Some companies build their businesses upon the ignorance of their customers. As a result, their moats decrease in direct proportion to the savviness of their customers. Moats built upon ignorance have become increasingly tenuous as technological developments and market conditions have led to savvier customers. Increasing competition. A more challenging competitive environment increases the pressure for businesses to cut costs, which incentivizes ignorance removal. Early adapters and social proof. Early adapters who assess the benefits of less known products, may induce others to adapt later on. Declining search and discovering costs. Low S&D costs lead to savvier customers. The fact that Honeywell’s struggles in China are related to the “savviness” of its customers and the quality of competing Chinese brands is disconcerting. The rest of the league continues wearing helmets that have inferior safety ratings. Riddell and Schutt, who have long outfitted most NFL players, continue to dominate the market. While the incumbents may benefit from these psychological tendencies in the short-term, it’s a tenuous proposition to suggest that, without sufficient improvements to their helmets, their moats will endure. Early adapters and social proof will aid continued adoption of safer helmets. Furthermore, extra-vivid evidence of any injury sustained with a Riddell or Schut helmet could drive wide-spread adaption of safer helmets. Highly reliant upon ignorant consumers, retailers and consumer brands have crumbled under the pressure of increasingly savvy-shoppers. Having built their moats upon high search and discovery costs, they’re unable to withstand rapid declines in consumer ignorance. Toys “R” Us is one such example. Lesson: Beware of moats built on exploitation. Seek moats built on reciprocity. A moat built around consumer ignorance is tenuous in nature. For a long-term sustainable advantage, search for companies that would benefit from declines in ignorance. Or as Charlie Munger might say, find companies that deserve to earn sustainable high returns on equity. Companies who exploit ignorance don’t deserve it. One of Charlie Munger’s three investment holdings is Costco. Costco offers best in class service at best in class prices. Both of which are highly valued by its customers. Neither of which is easy to duplicate. Hence, Costco deserves the favorable return it earns. Question: Would customers choose this company’s product or service if they were well informed and had access to their competitor’s products/services? Companies will accumulate operating inefficiencies as they grow. When this growth inevitably slows or declines, companies may seek to expand margins by eliminating these inefficiencies. Problem: First Sales Decline after 13 years of growth. Solution: Seek efficiency gains through cutting jobs, reducing layers of management, & speeding up product roll-out. Problem: Experiencing Industry-wide Pricing Pressure & Expiring Patents. Solution: Seek Efficiency Gains through cost cutting and dramatic reduction in the work force. Problem: Experiencing Shifting Consumer Tastes and Declining Sales. Solution: Seek efficiency gains through Cost Cutting, Industry Consolidation, Restructuring (simplify product offerings), Boost Dividends, and Make Acquisitions to Accelerate Growth. Problem: Dealing with Major Corporate & Political Scandal, recently became the largest auto company, by volume, in the world. Solution: Optimize business through Restructuring (selling any business segments no longer considered critical). Problem: Expanded store count too fast and with too little consideration for cost. Struggled with major shifts in the retail sector as well as disruptions in its supply chain. Solution: File for bankruptcy production, close a majority of company stores, and (presumably) focus efforts on sales through department stores, online retail, and home-shopping networks. For decades properties surrounding U.S. colleges had a can’t miss combination of limited supply and an ever increasing demand for degrees. On several occasions I’ve been advised by successful real estate investors to buy college properties . This was sound advice for decades, and may still be, but what if the game has changed in a big way? What if the demand for U.S. college has shifted dramatically lower, and with it, demand for university housing? Two WSJ articles shed some light on these very real, yet uncommonly held concerns. “This marked the fifth year of consecutive decline in the overall showing of the U.S. This ranking listed 62 U.S. schools in the top 200. In 2014, 77 U.S. universities ranked in the top 200. The tailwinds that favored college housing for the last 30 years have slowed. If the demand for U.S. college degrees has indeed shifted downward, I’d expect demand to dry up in traunches, starting with third tier universities and moving on up. This would imply that real estate around third and second tier universities is more vulnerable to a downward shift in demand, while first tier universities would fair relatively well. Lesson 1: Insist on thinking things through. It’d be far too easy to blindly follow the advice of a successful investor. To avoid going terribly astray, insist on thinking things through. Do not simply take an expert’s word for it. Lesson 2: Look out for things that have changed in a big way. In the past, college housing benefited from huge long-term tailwinds. But as the famous investment clause suggests, past performance does not guarantee future returns. Do not naively extrapolate past trends into the future. Rather take time to assess what drivers will harm or benefit an investment moving forward. Question: Has anything changed in a big way? The unknown path of Irma, along with extra-vivid evidence of its destructive power induced widespread panic and buying across the entire state of Florida. There’s an investing lesson in there somewhere. International disagreements and conflicts result in economic “attacks” much more frequently than they do in military attacks. Be careful that your investment doesn’t end up a casualty of economic warfare. The statements below address what’s happening in air travel, but doesn’t address why. To draw the inference that customers only care about price would be misleading. After all, price is the only factor in the purchase decision which customers can easily assess. Factors such as comfort, amenities, and service are either not easily assessable or completely unknown. So of course air travel has tended towards commoditization. After all, why pay 20% more for a flight when I have no idea what I’m getting for the extra money? Why not give consumers an easy way to objectively assess comfort, amenities, and service and see what happens? If an American Airlines flight had an 87 rating on comfort, amenities, and service, I’m likely to pay up for that flight over one with a 62 across the board. Or better yet, attempt to assign some dollar value to them. Such a system would contribute to the de-commoditization of flights. But as it stands, these factors are wholly unassessable, and thus, I’ll continue to be over-influenced by price. “They’re the only two people who came to the meeting with a deal to be made.” – President Trump on cutting a deal with Democrats.